The chickens are coming July 28! On May 24, Milwaukee aldermen amended Chapter 78 of the Milwaukee Code of Ordinances by an 8-5 vote to allow the keeping of chickens in the City of Milwaukee. Madison has allowed “backyard chickens” since 2004, with few problems reported. Henbassador Kilbourn pictured at right! The sponsor of the “chicken ordinance,” Alderman Nik Kovac and co-sponsors Baumann, Coggs, Witkowiak and Zielinski pointed to this trouble-free experience in making their case to more reluctant colleagues. Alderman Kovac and chicken advocates had worked for well over a year with the city departments that would be involved in one or another aspect of implementing such a change. They secured letters of support from the Commissioners of City Development, Health, and Neighborhood Services. Neighborhood Services will be the lead agency to administer the new policies. They will issue the permits and investigate complaints. The ordinance gives the Health Department authority to take measures in a highly unusual situation, such as an outbreak of avian flu or other public health threat. The change will go into effect on July 28. That’s the day chickens will be legal. Don Schaewe, Environmental Code Enforcement Manager in the Department of Neighborhood Services indicated that he and his colleagues are working on the details as this issue goes to press. When everything is finalized DNS will prepare a publication that explains where and how to apply for a permit to keep chickens. Those who hope to keep chickens can prepare now. The ordinance requires that your chicken coop be located at least 25 feet from any residential structure on adjacent lots. Each hen (you may have up to four hens, and no roosters) needs to have at least 16 square feet of space. So you can get out a measuring tape and pace off your yard now, to see if it’s spacious enough to meet these tests. To get a permit, you must obtain permission from the owners of the properties “directly or diagonally” abutting yours, so if you’ve verified that your yard is big enough, the next step would be to contact the neighbors. The ordinance requires permission from the property owner, since renters can come and go. The property owner is responsible for informing or consulting their tenants about this, though if you know your renter neighbors, you can certainly do some outreach. If you don’t know who owns a neighboring property, you can find the name of the building owner at milwaukee.gov. On the left sidebar, there’s a link called “Get Property Information” where you can look this up. If you’ve got a large enough yard, and willing neighbors, then you can plan to build or purchase a coop. Your hens must be provided with a covered enclosure – and it must be either raised off the ground, or set on a hard surface such as a concrete slab or patio block. 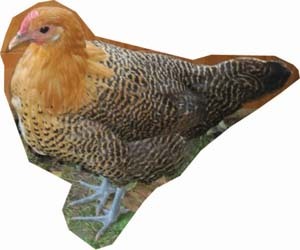 The website run by Madison’s Mad City Chickens (madcitychickens.com) has pictures, information and links to some helpful websites. Please keep in mind that chicken coops need to be designed to protect your chickens as well as contain them. There are hawks, cats, and even coyotes in the city that would be more than happy to make a meal out of your feathered friends. If you secure your permit and install a coop and hens, hopefully you’ll soon be rewarded with fresh eggs. You can share what you don’t use with friends or neighbors. However, city codes forbid the sale of food without a license, so don’t set up shop on your front steps. Also be aware that pathogens – disease causing bacteria and other microbes – remain part of the natural environment, and can be found in food produced locally. Producing outside the corporate agricultural system is not a guarantee of safety. After you collect your eggs, refrigerate them as you would eggs from the store. Chickens For One Year Only? There’ll be pressure on Milwaukee’s pioneer hen owners. A dubious Alderman Witkowski succeeded in attaching a “sunset clause” to the changes made to Chapter 78. This means that the Council must reauthorize the legalization of hens in one year. If they don’t take action, Milwaukee will return to being a hen-free city. The Council also mandated that the Department of Neighborhood Services prepare a report on their experiences with permitting, problems and complaints at the halfway point in six months. So – would-be chicken owners – get to know your neighbors. Work with DNS staff to resolve problems if any arise. If disputes or sanitation problems sour residents and city agencies on this aspect of local food production, many who worked hard to bring this change will be justly disappointed.